NASA is going to Mars again, this time with the first spaceship dedicated to digging deep below the surface to find out what's shaking on the red planet. GUEST BLOG / By Amanda Barnett, CNN--InSight spacecraft is scheduled to launch May 5 from Vandenberg Air Force Base in California on an Atlas V 401 rocket. The launch window opens at 4:05 a.m. PT (7:05 a.m. ET). It will be the first NASA mission launched to another planet from the West Coast, and it'll be visible to millions in Southern California from Santa Maria to San Diego. NASA's previous interplanetary missions were launched from Kennedy Space Center in Florida. If it all goes as planned, after a six-month journey, the 790-pound (358-kilogram) probe will land on November 26, joining five other NASA spacecraft operating on and above Mars. 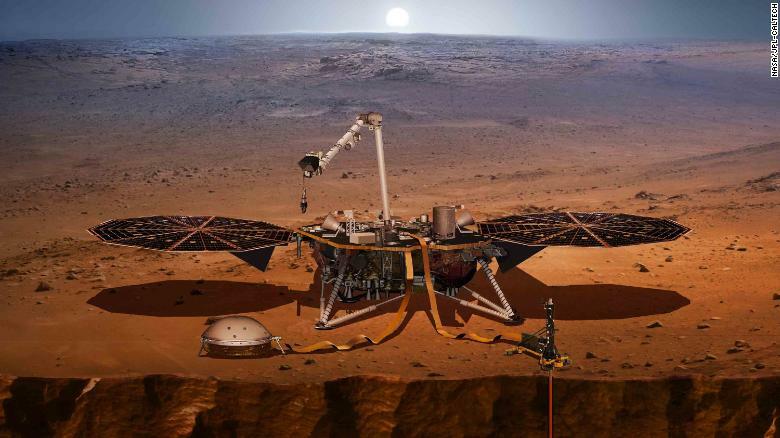 The mission's principal investigator, Bruce Banerdt, told CNN via email that he was "already pretty crazy about Mars" when he was 8 or so, and his excitement about sending a spacecraft there "is really starting to get intense!" Banerdt said he thinks InSight will fill the last gaping hole in NASA's exploration of Mars. "We have mapped the surface of the entire planet in terms of visible features, topography, gravity and magnetic fields," he said. "We have studied the atmosphere, both globally and at the surface. We have roved around the surface at four different places, studying the geology and piecing together the history of the surface. But until now, the vast regions of the planet deeper than a few miles, or so, (have) been almost completely unknown to us." He added, "InSight will change that with a single stroke." InSight will help scientists draw the first detailed map of the interior of Mars, and Banerdt said it's hard to overstate how much science that map will create. So, how do you study a planet that's 75 million miles (121 million kilometers) away? InSight doesn't have wheels, so once it lands it stays put. It can't roll around gathering up dirt to study. But it does have a 7.8-foot-long (2.4-meter) robotic arm. The arm will place a seismometer on the ground to detect "marsquakes" (think earthquakes, but on Mars, of course). Another instrument will dig 16 feet (5 meters) into the ground, deeper than any instrument ever sent to Mars. The arm has a camera that will snap color 3-D images, and there's a second camera on the spaceship's body that will provide wide-angle views. "The first image will be taken less than an hour after touchdown and should be available on Earth within the first day," Banerdt said. "We should have images of the landing area within a week." InSight will use its radio system to measure the wobble of Mars' north pole to help scientists learn more about the shape of the planet. And finally, Banerdt said, InSight "will have one of the best weather stations ever placed on Mars, measuring pressure, wind and temperature around the clock for at least a Martian year." InSight's primary mission is for two years, but if all goes well, Banerdt said he'll ask for an extension. This new NASA spaceship won't be going alone to Mars. Two suitcase-size spacecraft will be launched on the same rocket. They will trail behind InSight and will orbit Mars as part of a NASA experiment to see whether they can be used to relay data back to Earth.